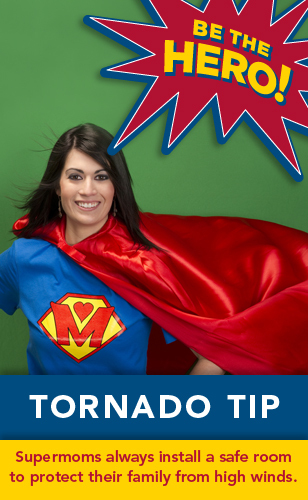 Supermoms and superdads always install a safe room to protect their family from high winds. Site-built safe rooms can be constructed with concrete, concrete masonry, and combinations of wood frame and steel sheathing or concrete masonry infill. Manufactured safe-rooms are usually built at a plant or assembled on-site. Wind Forces and Debris Impacts – Safe rooms must be designed for wind speeds up to 250 mph and debris impacts from a 15 lb. 2×4 board traveling at 100 mph. Safe rooms must be structurally independent from the main structure of your home. Safe rooms must be securely anchored to the foundation or to a reinforced concrete slab. All components of safe rooms, including walls, ceilings, and door assemblies, must be designed, tested to resist specified wind forces and prevent perforation by windborne debris. Safe rooms can be located on the first floor, in a basement or outside a home. Shelters located outside your home should be accessed immediately when a storm warning is issued. Site-built safe rooms should be constructed in accordance with the prescriptive designs of FEMA 320 guidance Taking Shelter from the Storm: Building a Safe Room For Your Home or Small Business, and meet the ICC/NSSA 500 standard. Manufactured safe rooms and site built safe rooms that deviate from FEMA 320 or the ICC/NSSA 500 standard must be tested for debris impact resistance at an approved laboratory such as the Wind Engineering Research Center at Texas Tech University. Verification of compliance with National Storm Shelter Association’s “Association Standard,” required for membership in the Association, provides the highest level of residential shelter quality.